To receive emails/videos about the insights revealed in The Growth Director’s Secret and ideas about how to unlock profitable growth in your business. Sign up here. WHAT IS IT – AND WHY DOES IT MATTER? Growth is probably the single most important attribute a business can have. Data shows that when businesses grow, unit costs fall, profitability improves, employee morale is better, share price appreciates – and CEO tenure is demonstrably longer! It’s a paradoxical truth that despite the overwhelming importance of growth to a business’ medium/long-term success, most companies (90% according to Bain) fail to sustain profitable growth for any meaningful period. So – why does The Growth Paradox exist? Most companies don’t take growth seriously. After all – why is it that only 4% of businesses have a ‘Growth Director’ on their senior team? Almost all companies make the same Big Growth Mistake. A fundamental misunderstanding about how consumers choose between brands and make purchase decisions. Conventional research tools simply don’t work. It’s no wonder that so many companies’ highly-researched commercial plans simply fail to deliver growth. 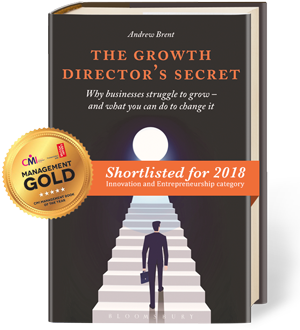 Each of these pose significant challenges to conventional business thinking and each is examined in some detail in the pages of ‘The Growth Director’s Secret’. The book goes on to reveal how new understanding of how our brains work and how we decide which brands to buy is driving radical new approaches to the task of positioning companies for growth, and how the very best businesses are beginning to utilise these learnings to out-grow their competitors. Would your business benefit from understanding why The Growth Paradox exists, and what you can do to ensure your company is one of the 10% that grow profitably? Then visit the Think Again website to find out more, or sign up to view the blogs and video messages that summarise the major growth insights. Who knows – you might just discover The Growth Director’s Secret! To receive the remaining seven videos in this series, along with news and views on strategy and growth. Sign-up here.